In 17th-century Germany, a favourite pastime of nobles was to catapult foxes in to the air and then club them on landing, while last century someone thought it would be a good idea to race cheetahs on greyhound tracks. And as for the person who came up with ski ballet... Edward Brooke-Hitching has scoured the pages of history to discover over 100 forgotten sports from around the world, from the ancient and lethal sport of buffalo jumping, through the insanity of auto polo, to phone-booth stuffing. This book takes you on a breathless romp through the back alleys of history to from an indispensable collection of the cruellest, most dangerous and downright ridiculous entertainments of all time. 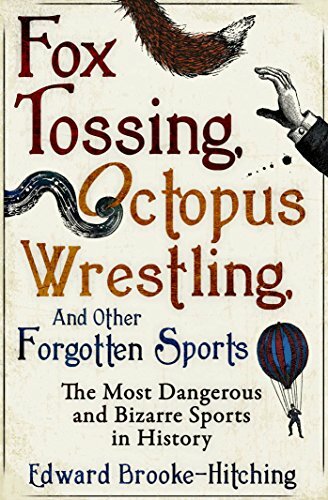 Fox Tossing, Octopus Wrestling, and Other Sports: The Most Dangerous and Bizarre Sports in History, is a curious and intriguing insight into some of the most bizarre, amusing and somewhat outlandish sporting activities devised, a fantastic coffee table read and perfect for sporting fans and history lovers. This paperback book has 258 pages and measures: 20 x 13 x 1.5cm.